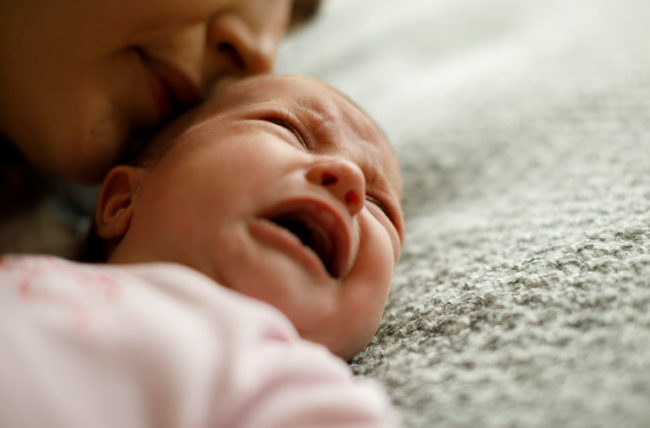 Q: How can I tell when my baby is tired? A: Parents sometimes can tell the difference in their baby’s cries. One means tired and another means hungry, for example. But the reason for fussiness isn’t always obvious. Sometimes parents get frustrated when their baby seems to be crying for food but refuses to eat. That can be a sign that the baby is actually tired, not hungry. Being hard to calm down. Turning away from stimuli, including the breast, bottle, sound or lights. Sweating (because the stress hormone cortisol increases with tiredness). On the other hand, if your fussy baby is rooting or turning toward your breast, hunger likely is the cause of distress. To prevent baby from becoming overtired, put him or her down for a nap as soon as you notice signs of drowsiness, such as eye rubbing and droopy eyelids. Newborns can sleep 20 of 24 hours and be awake for only 45-minute increments. By 4 months, babies usually sleep 10 to 12 hours at night (waking up once or twice to eat) with three to five hours of napping throughout the day. By 6 to 9 months, they usually stop waking up to feed at night. By 9 months, napping begins to shorten. There’s a range of “normal” sleep habits, and all babies are different. But keeping babies on a regular sleep-wake schedule will help them be better at falling asleep, staying asleep and not becoming overtired.